PDA for your PDA premiered on March 26, 2009 as part of the How Soon is Now: Contemporary Art from Here exhibit at the Vancouver Art Gallery on March 26, 2009, curated by Kathleen Ritter. Images show the installation of the projection in the VAG rotunda while panel and audience members participated in creating a communal poem; along with PDA text from the Britannia Library Gallery installation, and a lecture "Of Audience to a Dream: Performative and Embodied Writing" at Emily Carr University of Art & Design in 2011 where PDA was recreated and performed with students and faculty.. When panel and public were assembled and seated for the How Soon Is Now Panel Discussion, I briefly introduced this participatory piece requesting the audience to commemorate the moment by texting a short phrase of love and affection to a designated phone number. 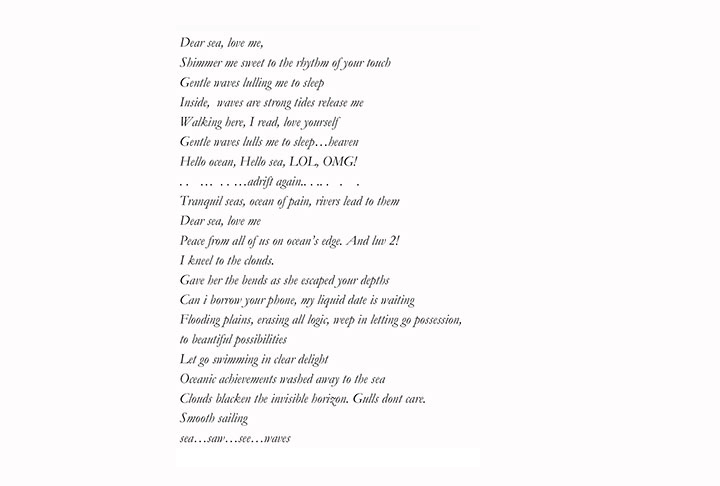 A local computer in the VAG automatically assembled the collected phrases into a poem of love in almost real-time. The poem was projected onto a large screen in the rotunda as sentences were texted in. 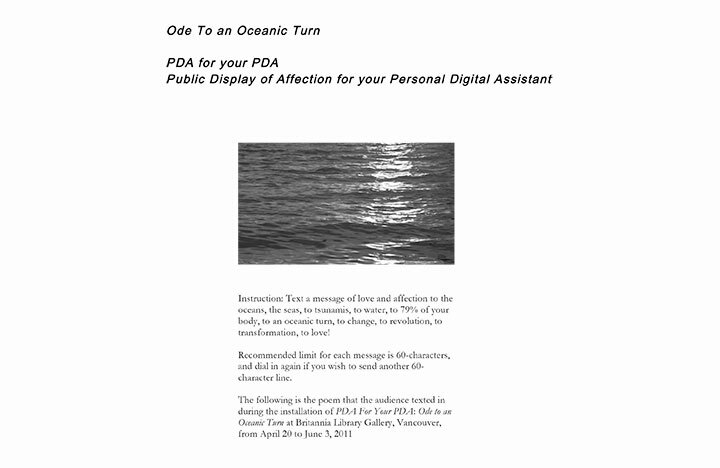 With: PDA for your PDA (Public Display of Affection for your Personal Digital Assistant) Laiwan will present this participatory event as a complement to the panel. Bring your PDA. This series of evening talks in the Gallery will bring together artists to explore contemporary art practices focusing on works within How Soon Is Now. From architecture to social engagement to the nature of interdisciplinary art, issues pertinent to local and international artists will be investigated. Free with Gallery admission.